One of the episodes is “Nightmare at 30,000 Feet,” a riff on “Nightmare at 20,000 Feet,” one of the most famous Twilight Zones, featuring a riveting William Shatner performance. “Nightmare at 20,000 Feet” has been remade once before, for what is generally regard as the best segment of Twilight Zone: The Movie, starring John Lithgow and directed by George Miller. “Nightmare at 30,000 Feet” has a similar premise to its predecessors: a nervous man (played by Adam Scott in this version) becomes panicked and paranoid during a long flight, disturbing his fellow passengers. But the actual plot is entirely new—almost brazenly so. The other episode debuting today, “The Comedian,” is… well, it’s pretty bad. "The Comedian" / "Nightmare At 30,000 Feet"
So let me dispatch “The Comedian” first, so we can get to the good stuff. Samir soon realizes that JC means this literally. When he makes a joke about his dog, or his girlfriend’s nephew, or one of his rivals at the club, before he even leaves the stage, those living creatures have disappeared from reality, past and present. That’s a good premise for a Twilight Zone episode (or even an episode of Rod Serling’s Night Gallery, which told a similar “desperate comedian gets more than he bargained for” with “Make Me Laugh,” directed by young Steven Spielberg). But is it a good enough premise to stretch past the 50-minute mark? Friends, it is not. 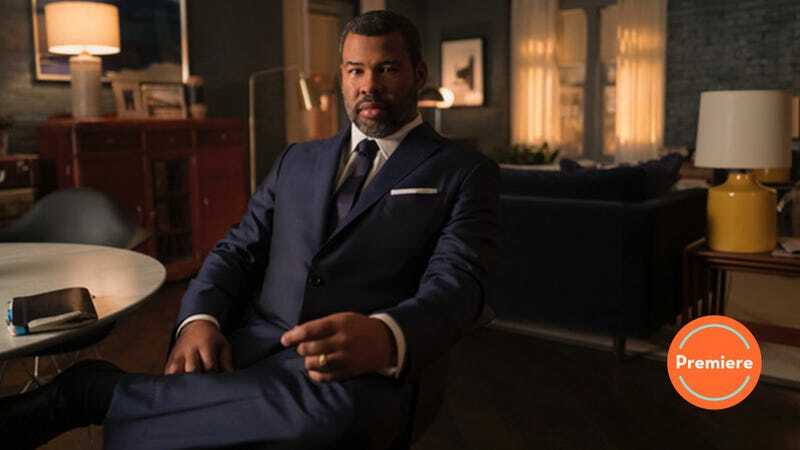 The first sign that “The Comedian” is going to be a slog comes pretty early, when it takes well over ten minutes for Rubens and Harris to get to the part where Jordan Peele shows up in his dapper suit, telling us in a deadpan voice that Samir Wassan has entered… the Twilight Zone. The main problem with “The Comedian” is that it gets too hung up on considering every angle of its poor protagonist’s “gift,” to the point of grinding repetition. It takes too long for Samir to grasp that he has to power to erase people from existence. Then once he realizes that some of his small changes have big ramifications—costing him, for example, his relationship with his long-suffering girlfriend Rena (well-played by Amara Karan)—the plot doesn’t really twist any further. Wassan just keeps logging one loss after another. Nanjiani is a strong lead, and Diarra Kilpatrick gives a feisty performances as an ambitious colleague who insults, infuriates, and inspires Samir. The episode as a whole has an intriguing perspective on comedy and fame, suggesting that the public demands their favorite celebrities sacrifice their souls. But this is a pretty sour point-of-view to stew inside of for nearly an hour. Nearly an hour! There’s absolutely no excuse for “The Comedian” to be such an endurance test. “Nightmare at 30,000 Feet” is also maybe a bit too long. (For one thing, the episode’s coda is a mistake. But I’ll get back to that.) But at least most of its superfluities are entertaining, and thematically defensible. Co-written by The Defenders and Daredevil writer/producer Marco Ramirez and stalwart The X-Files writer/producer Glen Morgan, and directed by Emmy-winner (for the House episode “House’s Head”) Greg Yaitanes, “Nightmare at 30,000 Feet” has Adam Scott playing Justin Sanderson, a successful but stressed-out investigative reporter, taking transatlantic Flight 1015 to Tel Aviv, at 10:15 p.m., on a stormy October 15th. In the original “Nightmare”—and in the Twilight Zone movie—the jittery passenger freaks out because he sees a gremlin tearing up the airplane’s wing. In this updated version, Sanderson discovers a digital audio player in his seat-pocket, containing an unsettling podcast… about the mysterious disappearance of Flight 1015! In essence, “Nightmare at 30,000 Feet” tells the same story as the earlier “Nightmare.” Justin wears on everybody’s nerves as warns that they’re all in mortal danger, according to the disturbing details he’s picked up from the podcast. Ultimately, after he’s been restrained and the plane lands, we find out that—just like the characters played by Shatner and Lithgow—Scott’s Justin Sanderson was right to be terrified, albeit for different reasons than the flyers who traveled through the Twilight Zone before him. The creative team also pushes at the viewers’ preconceptions—and at the hero’s—by having this plane bound to Israel be occupied by bearded Muslims, muscular Russians, and a drunken ex-pilot played with maximum oiliness by Chris Diamantopoulos. As the podcast tips Justin off to who his fellow passengers are—and insinuates that one of them may be responsible for Flight 1015’s troubles—he overreacts, and misjudges who’s-who, and what they’re all up to. The episode never makes too big a deal about Justin’s presumptions… at least until the climax, when he seals his and his flight-mates’ doom by effectively turning the jet over to Diamantopoulos’s unhinged flyboy. Even though he’s heard this guy talk about how he lost his job for “one too many mistakes I can’t take back”—and even though he’s seen him guzzling many mini-bottles of liquor—he seems to trust implicitly that the affable white guy knows more about what to do than all the darker-skinned and thicker-accented folks on the plane. My one big beef about “Nightmare at 30,000 Feet” is that it has a perfect ending: Adam Scott giving a very Adam Scott line-delivery of, “Oh, he’s the pilot!” as his Sanderson realizes whom the podcast has been talking about all along. Then it undercuts that stinger with a cutesy epilogue, as the hero wakes up on an island and discovers a new podcast, which describes his death at the hands of all the other passengers who survived the plane’s crash. Cut to: those very passengers, headed his way. Ha ha. 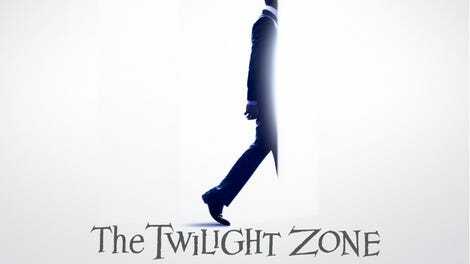 Still, “Nightmare” makes a much better case for the relevance and viability of this new Twilight Zone than “The Comedian” does. Stylistically, it plays with a very particular kind of modern alienation: the feeling of being constantly under surveillance, yet completely alone. Flight 1015 has cameras set up so passengers can observe the pilots; and nearly everyone has a phone ready to document each of Justin’s meltdowns. Yet whenever he puts on his noise-cancelling headphones to listen to the podcast, the episode’s audio mix subtly changes to emphasize his isolation. No one’s sharing his delusion—if that’s what it is. At one point, an air marshal tries to pull our man back from the brink, telling him it’s “easier to recover from being wrong” than to atone for whatever stupid thing he’s planning to do. But despite his anxieties, he’s a confident dude, this Justin Sanderson. He’s going to keep smugly insisting he knows what’s right, all the way down to the ground. Jordan Peele is no stranger to “Nightmare at 20,000 Feet.” He’s already starred in his own version (sort of)!